Ever since Hannah started daycare, my favourite time of the day is pick-up. After working all day, as I get closer and closer to pick-up time I get more and more excited to see my kid. My least favourite time of the day is bedtime. (And depending on the mood she's in when she wakes up, morning can be equally frustrating.) I doubt I'm alone. I read some place to prevent tantrums I should give signals to Hannah when I need her to switch gears. So, I say things like "In 10 more minutes, we're going to start the bath water," and in the bath tub, I warn, "In five more minutes I'm going to drain the water so your hair has time to dry before bed." Hannah has taken these transitions to heart. Now when I tell her it's time to stop one activity and start the next I get, "OK Mommy, in five more minutes." So she's definitely a "Master Negotiator". And OK, OK full disclosure...as bed time draws near, depending on what time it is, I signal to her she can watch one more Paw Patrol or Yo Gabba Gabba. 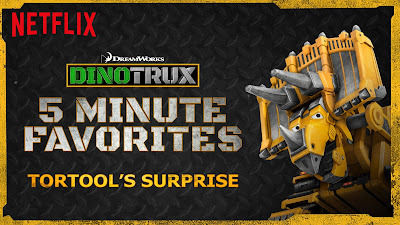 Sometimes if she negotiaites one more show, I go for Animal Mechanicals since the episodes are only 11 minutes long. But now Netflix has done one better. 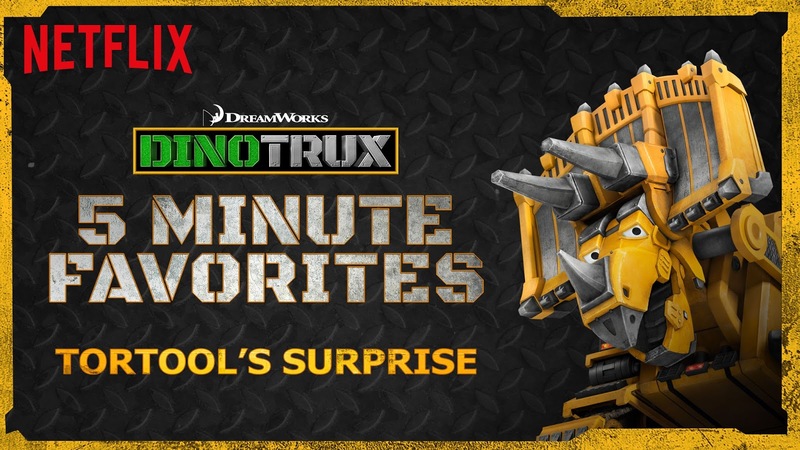 There are three Dinotrux 5 Minute Favourites. So the next time she pulls, "Five more minutes!" There are three Netflix episodes to stream. 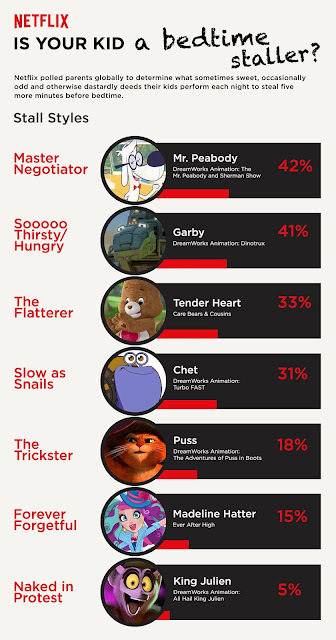 Do these Netflix poll statistics ring true in your home? Has Netflix helped you with your bedtime staller?